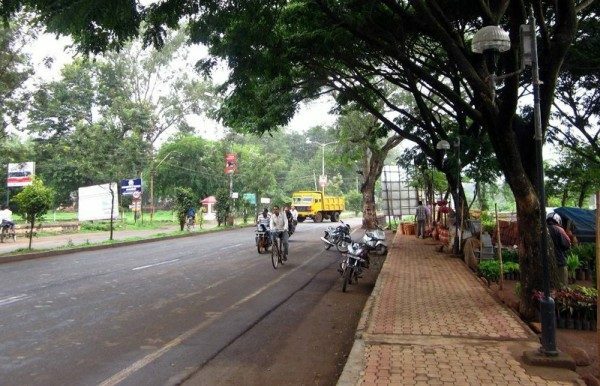 The City Belagavi might look very well lit with some great decorative lamps, Pavered Footpath but it is missing one small thing to ago with it Good Motor-able Roads. The somewhat Good roads are re carpeted each year and the worst roads are hardly patched, may be they want them to turn into huge craters and the local residents can get a feel of Neil Armstrong. Citizens have been shouting out a loud about the pathetic road condition of Congress road in and after the monsoon. Some patch work was done later which was basically a facial makeup and the promise to make new road after the rain stops is still not visible, but what is disheartening to see is the same corporation spending in Crores on the Same congress road for decoration. The CCB is spending a whopping 98 lalkhs+ for Providing Pavers left side footpath at Congress Main Road from Ramaswamy Road to 1st Railway gate and now will spend another 20 lakhs + for Providing Decorative Median Lighting from Nanawadi cross upto Second Gate. Belagavi has been selected as a smart city and everyone is proud of it, but by spending crores on road which is in very bad state, especially from 2nd gate onwards what is the rationale behind spending so much on decoration and not on making the road instead? We can only say it is Congress Road’s DurBhagya. Congress road is the only road in Belgaum which has got all kind of patch work like pevars , Tar, Bricks but no proper road buildup. However Belgaum has got selected for Smart city but in some colonies like Nanawadi Near Ayappa swamy temple there is no pakka road and Corporation water supply still people are paying property taxes. For the last Three months sector no. 11 ,7th road 7th cross ,residences are getty drainage water supply and inspite of letters to local corporator and corporation commissioner, no solution. Are living in a stone Ave in jungle? Agree parking carelesssly on the congress road is a real problem. Specially in front of More and the Alipak centre. Cars are the major culprit. Congress road a board must be put highlighting as accident prone every day something happens either side public park their vehicles making it smaller for vehicles and causes traffic. New hole has been dug in the middle of the road for some cable it has been left open. Uday rightly said Congress road durbhagya. Most of the money is going to the CCB rulling party as well ………….. The tar road of teachers colony KHASBAG second cross is still pending. I humbly request Muncipal commissioner to take up the matter on priority.